Telangana Model School Hall Ticket 2019 | TSMS 6th, 7th, 8th, 9th Class Entrance HallTickets Download@ telanganams.cgg.gov.in. TS Model School 6th Hall tickets 2019 | TSMS 6th Class Admission Test Hall tickets at telanganams.cgg.gov.in. The Commissioner of School Education, Govt of Telangana released TS Model School Hall tickets 2019 for the Admission Test. The Commissioner and School Education Department officials issued the TS Model School Hall ticket for 6th Class Entrance Test 2019 TSMS CET 2019 Notification in the month of January 2019 for admission into VI class in Telangana Model Schools for the academic year 2019-2020. 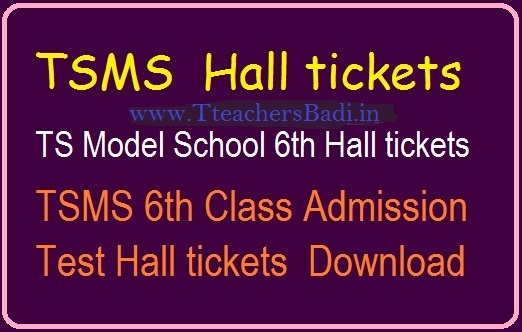 TSMS Hall tickets 2019, TS Model School Hall tickets for 6th, 7th, 8th, 9th Class Admission Test. telanganams.cgg.gov.in halltickets TS Model School admissions 2019.